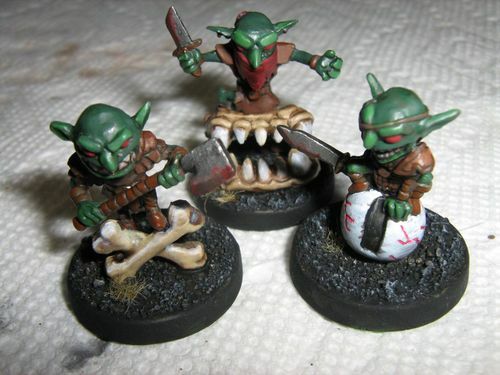 Introduction: If you already paint miniatures, these should be straightforward. They are multipiece pre-assembled, which means that the models are assembled from more than one piece, and one piece can block your paintbrush as you attempt to paint hard-to-reach areas of the model. While most of the time, cutting apart a model to scrape off the mold lines and have a less hard time painting, it's usually not worth it. When painting, you generally want to paint from the "inside to outside", such as flesh before clothing. You may want to modify this to "covered to uncovered", since you often have hands holding weapons, and, for these models, feet on top of other things. Myself, I sort of do this, but also paint larger areas and easy areas first. I also may paint details after the basecoats, as well as do a step on one model, only because I have some leftover paint on another. I also usually do metal last, since metallic paints are sorta more difficult to use than non-metallic paint. For paints, I highly recommend the Army Painter Quickshade Ink Set. I'll be using the brown Strong Tone Ink for the leather armor and bones, Green Ink for the goblin flesh, and Red Ink for the goblin scarf. Alligator clips are useful for holding miniature parts. 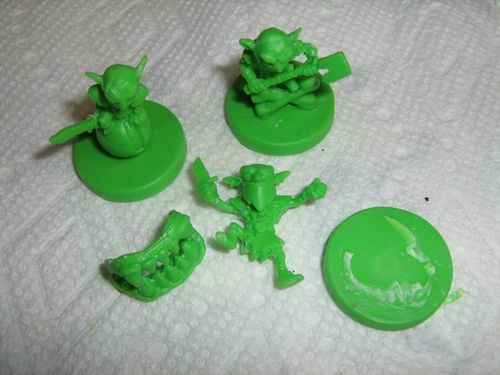 So here's a step-by-step guide for painting the miniatures. Feel free to paint in whatever order that's most comfortable for you. A. 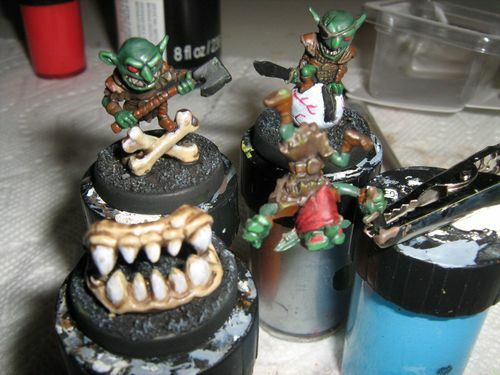 Cut the Fang goblin. 1. 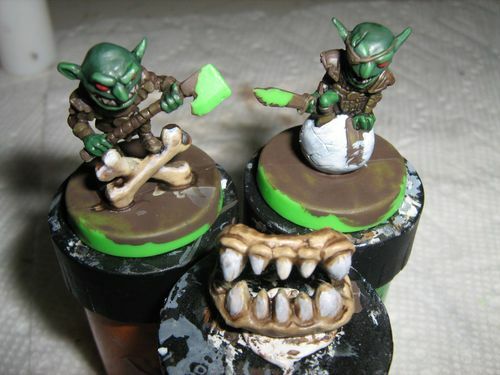 Cut off the Fang tribe goblin from the base and fang. 2. 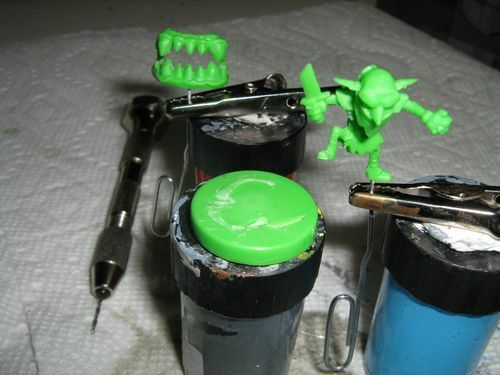 Pin the fang goblin to a paperclip. Glue with superglue. B. Prime in brown. 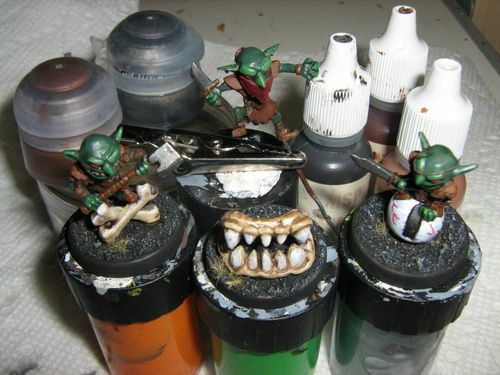 The brown will be useful for the goblin's leather armor and other brown parts. 1. Basecoat the bones in ochre, such as Army Painter Skeleton Bone. 2. Wash the bones in brown, such as Army Painter Strong Tone Ink. 3. 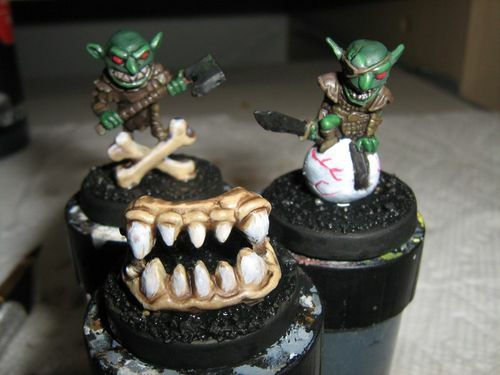 Touch-up the bones with white: paint the fang teeth white, and tops of the crossbones white. 2. Paint the pupil in black. 3. Detail the blood in red. 1. Basecoat in dark green. 2. Paint highlights in light green: eyebrows, tops of ears, nose, bottom lip, tops of legs, fingers. 3. 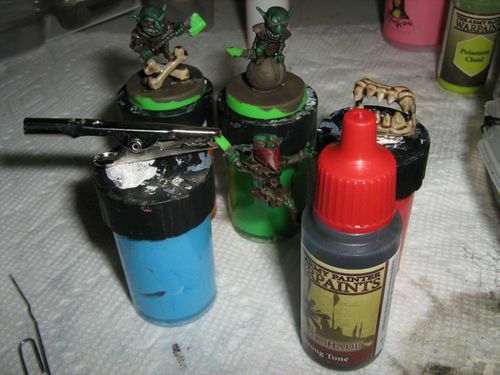 Wash with green, such as Army Painter Green Ink. 4. 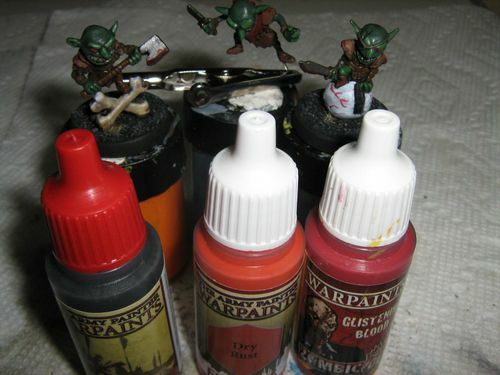 You can use a black-brown paint to blackline various flesh areas (eg. paint lines between the fingers). 2. If necessary, carefully outline the eyes with a brown wash.
2. If necessary, wash with a brown wash.
3. You may need to paint the spaces between the teeth. Use a brown-black paint. H. Paint the hair and eye patch with a brown-black paint. 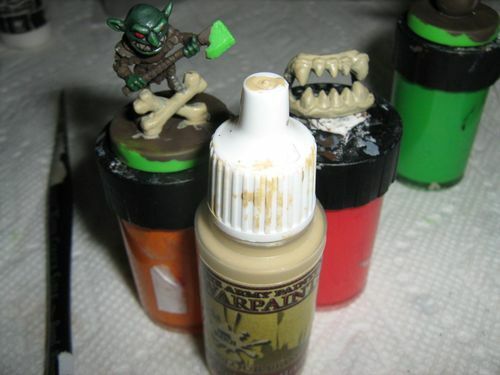 You can use the brown primer for the "string" of the eye patch. J. Paint the leather armor and wooden parts of the weapons. Use a variety of browns and brown ink. 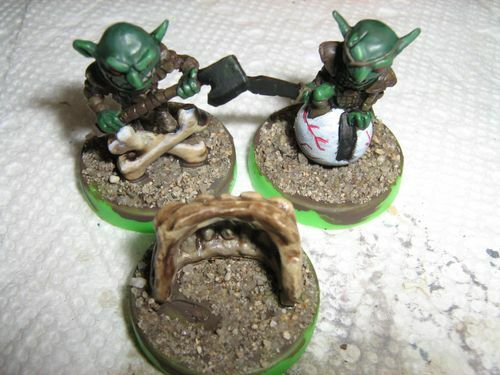 The brown areas behind the goblin with the axe may be more difficult to reach. I left part of this area unpainted with just the primer. I just painted the easiest areas I could reach lighter browns (eg. collars, belts, boots) and the rest darker. K. Paint the sword weapon hilts and buckles in a metallic brown. I used an ancient gold. When painting gold, first paint a layer of brown (undercoat), then the gold. 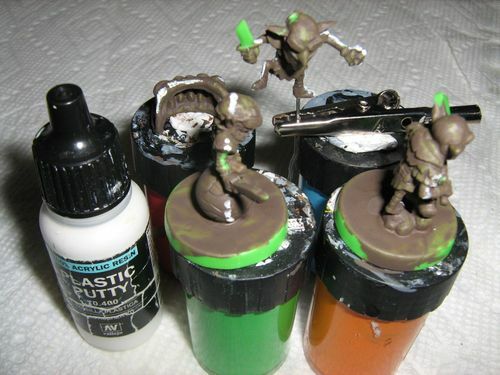 Since the miniature was primed in brown, you don't need to paint an additional undercoat layer. L. Paint the weapons. Underpaint with black, then paint in a steel metallic. 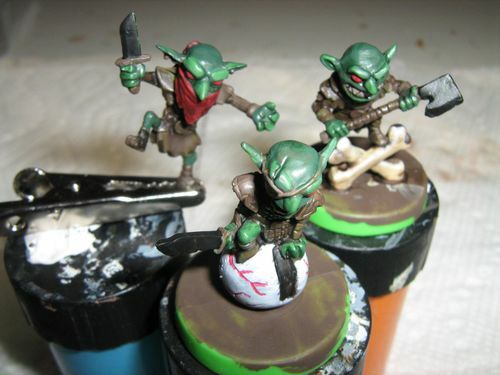 Hold the miniature next to a bright light, and paint the shaded areas a darker steel metallic (eg. mix black with a metallic). M. Rust the weapons. For a simple blood-rust, mix a red with orange and a brown wash. Apply the wash sparingly on the shaded part of the weapon. 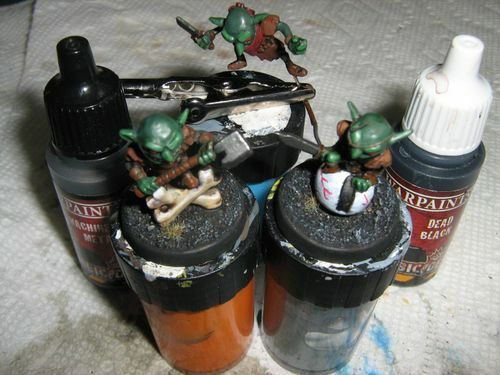 You can find more advanced techniques by searching on "miniature painting rust". In the pictures, I didn't necessarily follow these guidelines, since I prefer to paint easy and big over hard and small! 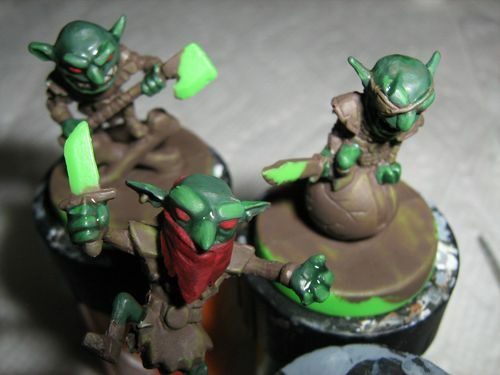 Hopefully, the paints in the pictures will give you an idea of what step I painted.